My goal is not to incite Islamophobia but to expose the evils of an ideology that is spreading throughout the West by means of strategic mass immigrations under the guise of war & political asylum. Europe has already succumbed (I have just finished watching several videos of Europeans bemoaning the semblance of what is left of their beloved homeland) and it is only a matter of time that we will suffer the same fate if we allow the cancer of Political Correctness to spread. As we become the persecuted majority, it is best to at least know the tactics employed by the enemy of our liberties, Islam, this ideology masked as a religion which morphs into a political agenda using Political Correctness to subdue its targeted host, the Christian Church. Since the US “still” has a lot of “professing” Christians, cunning Taqiya-employing Imams worm their way into the churches by syncretising Christianity with Islamic practices (we have so called Evangelical churches hosting Interfaith practices in the congregation) and before you know it, these “gullible” Christians will have compromised an essential basic Christian doctrine that Jesus is the Only Way and end up falling for the lie that we all pray to the same God. These same gullible Christians will then turn against the true Bible-Believing Christians and vilify them for being intolerant. Ahhh…The horror! But it isn’t. It’s actually mission accomplished and it will be if Christians don’t wake up! So I say, WAKE UP!!! This video clip may be old but it debunks the myths of the “Religion of Peace” that the mainstream media (especially our current administration) is feeding the masses and is quite an eye opener. Yes, it is a religion of peace but only, and only when it has conquered all those who are against it. May God raise up more people like Nonie Darwish who are bold and speak for truth regardless of the consequence. Next Hey You, Are We There Yet? Didn’t watch the video, as my audio is not working, but I totally agree with the text of the article dealing with Islam. Thanks. You should watch it when you get the chance. The threat was imminent when it was Barack Obama in office. Although we are in this new administration I believe we are getting a bit of a reprieve but…the effects of Obama’s policies have taken root and it would probably have been already implemented if Hillary Clinton won. 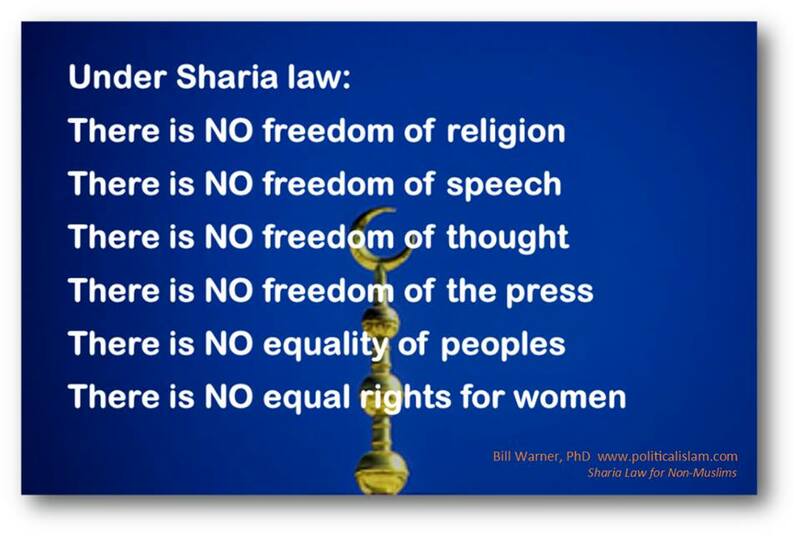 Implementation of Sharia is in the works in Canada and it is sad that Liberals are making an unholy alliance with Islam whose unholy book condemns and mistreat infidels, mainly most anyone who is not Islamic.